It’s no secret that Bluetooth on Chromebooks has been a pretty dodgy affair for quite some time. The issue has been getting more and more attention as detachables and tablets have started to enter the market, but a full-on, proper fix for connectivity issues with Bluetooth peripherals has still not been released by Google yet. We wrote not long ago about potential fixes rolling out to Chrome OS and, being completely candid, thought those fixes would already be in place and fully implemented by this point. The new Bluetooth stack – named “Newblue” – has been available behind a flag for some time now and users are free to switch it on in the Stable Channel at will. I’ve not been able to definitively and scientifically say that it makes audio connections better up to this point. My usage of it has seemed to help, but I haven’t had empirical evidence up to this point using audio. 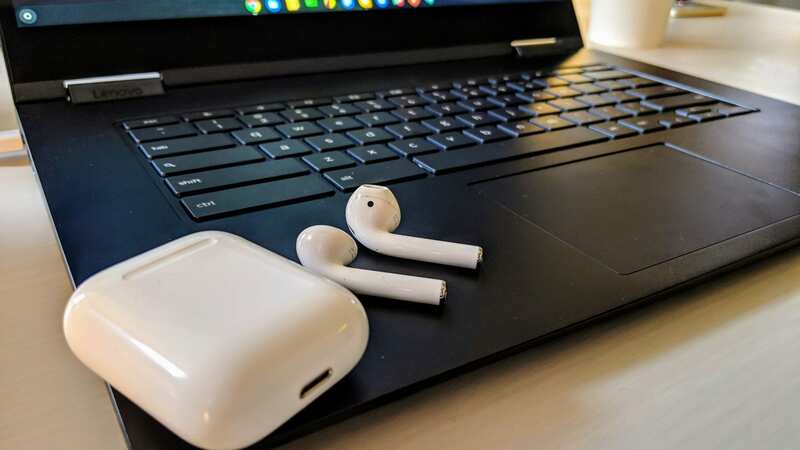 Today, however, I decided to give my AirPods a spin on the Lenovo Yoga Chromebook and was unsurprisingly met with dropped connections, stuttering tracks, and odd playback behaviors. I usually tend to use the Chromecast functionality to send my music to peripherals, so I’m generally not bothered personally by the crummy Bluetooth audio experience on Chromebooks. I really wanted to put some Bluetooth headphones through a real-world test, so I forced myself to listen only through my AirPods and only via Chromebook Bluetooth. While the AirPods paired up nice and quick, I legitimately didn’t make it through a single song without some sort of audio anomaly. It was honestly worse than I’ve ever experienced. In no way is this acceptable in 2019. My next step? Enable Newblue. This new Bluetooth stack isn’t necessarily a silver bullet that will fix every Bluetooth problem with Chrome OS, but it is being actively worked on and seems to positively affect devices that are currently experiencing issue with solid Bluetooth conectivity. After switching on the flag (by going to chrome://flags/#newblue and selecting “enable”) and restarting Chrome, I re-paired my AirPods and have listened through 3 full albums without a single issue. No stutters, no connection drops, no odd audio warbles. While Newblue may not be ready for primetime and may not be the fix for everything, it most definitely fixed the connectivity on my AirPods and makes using them at my desk or out on the go a real delight. Additionally, this new Bluetooth stack allows be to leave Bluetooth turned on for my Pixel 3 XL and Chromebooks and activate the AirPods back and forth as often as I like. Many times, switching Bluetooth peripherals back and forth between devices can be an achilles heel, making even the most solid devices start having issue. Putting the AirPods through this sort of test seemed to elicit no negative response and I was able to swap between my Pixel 3 XL, Chromebook and iPad without issue. Eventually, when we see Bluetooth hardware connections follow our Google Accounts, I’ll just be able to pair my headphones once and select my audio output on whichever device I want to be active at any given time. We hope to see that in the coming months, but for now, I’m very happy to report Newblue as a very good start to fixing Bluetooth on Chromebooks…especially with AirPods.